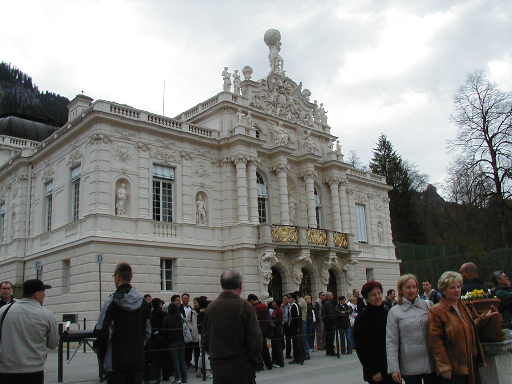 Linderhof. You can see it was overcast and threatening rain. Mian warned us to take our poncho or umbrella. "If you don't and you get wet, don't blame me, I've warned you." This palace is very ornate inside (they don't allow pictures inside). Its modeled after the Louvre in Paris. There are many portraits of famous French people and royalty. It makes one wonder what the guy's fascination was with the French. 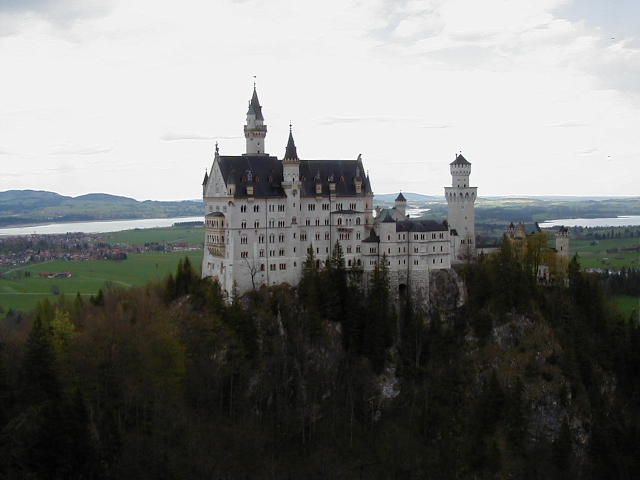 Neuschwanstein - This is a spectacular palace in a spectacular location. It was built as a summer palace. It was never finished. Maximilian lived in it only 179 days, and then was found dead in a lake under mysterious circumstances. The people of Bavaria did not like him. They immediately opened the palace for tours, so it has been just a place to tour for nearly 150 years.